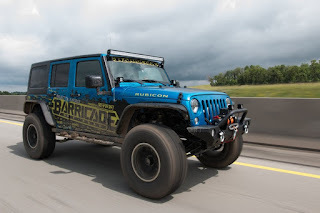 ExtremeTerrain and Barricade Off-Road unveiled their fully-built 2015 Jeep Wrangler Rubicon at the Bantam Jeep Festival. This awesome, modified Jeep led the Jeep parade on Friday. The goal... to set the Jeep Parade world record. The record was broken on April 26, 2015 in Daytona Beach with 1,846 Jeeps. Does anyone know if they broke the record? We all know a Jeep needs a name. This one is called Project Trail Force. It has $24,000 in aftermarket parts total worth $73,000. I want one!!! Guess what? We all can enter to try and win it. So what is this bad boy made of... Check it out!!! The driving force behind Project Trail Force is a centrifugal Ripp Supercharger, adding over 140 horsepower to the otherwise factory 3.6L V6. Project Trail Force sits 3.5” higher than stock thanks to Rock Krawler’s long-arm lift kit utilizing coil-overs to help give it the needed clearance for obstacles. Rounding out the look as well as the off-road performance are 37” tires and Mammoth Boulder Wheels to conquer any trail. Rear Bumper with Tire Carrier, Fender Flares -- I want these!!! 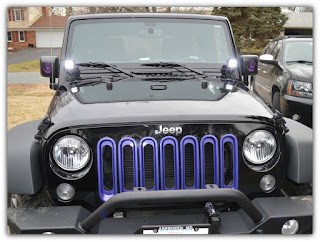 and a 50” double row LED light bar. In case that isn’t enough lighting to turn night into day, Project Trail Force is equipped with KC Hilites 7” LED headlights. On the inside, this 2015 Wrangler is hooked up by Rugged Ridge with a pair of their Grab Handles, All Terrain Floor Liners, Cargo Liner and Seat Covers. Finally, the interior is finished with a Raxiom OE-Style Navigation including Bluetooth and Back-up Camera to help you find the trail. WHEW!!! That is a mouth full! Well, I wish you luck in winning this awesome Jeep! I will be entering as much as I can. However I won't be getting my hopes up because I never seem to win anything.